Haigh Emporium formally Haigh Post Office. Its sad to see our Post Offices closed, one by one they are slowly disappearing. Only the post box remains. Where is the nearest Post Office from there? After saying that it cant have been a busy Office at the top of Haigh road. Colin, Just down the road near Finger Post. Harry, My grandparents came from Aspull & I visit the Cemetery just on the bend. At St Davids. But do you know who holds the grave yard plan of the old part? 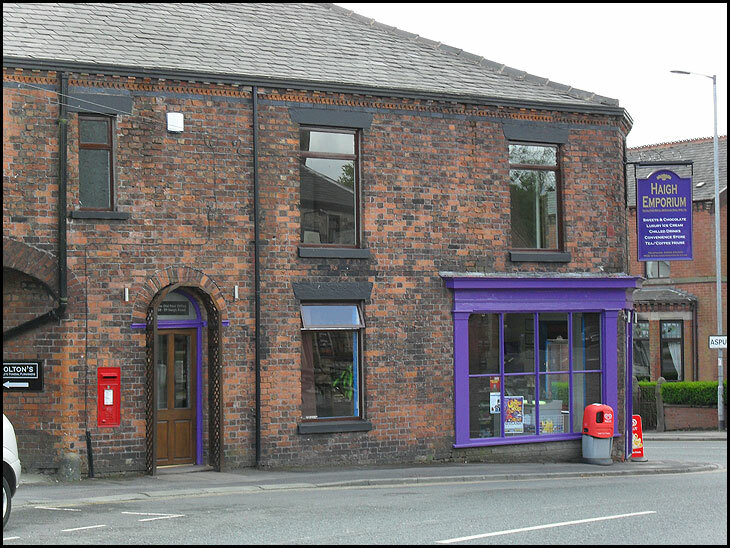 I used to call in the Post Office when I was around Haigh and there was always a few people in the shop, they also did car road tax then which attracted a lot of folk in, so I don't think they did so bad business wise, and it was somewhere to go to hear all the local news as well. The sign on the lamp post says it all - where does Aspull end, and Haigh begin? Thanks for your comments, its nice to see the shop open again,its good news for the community. Dorothy, sorry I don'tknow, why don't you ask in St. David's church.